Poynton Round Table is all about being social, having a laugh, trying things you wouldn't normally do, and doing some good in the local community. We are a social group made up of a bunch of lads, age 18 - 45, often found in the pub, and always happy to welcome new members. Find more about us and what we do here. Its always good to have new aims, ambitions, and plans for a New Year. 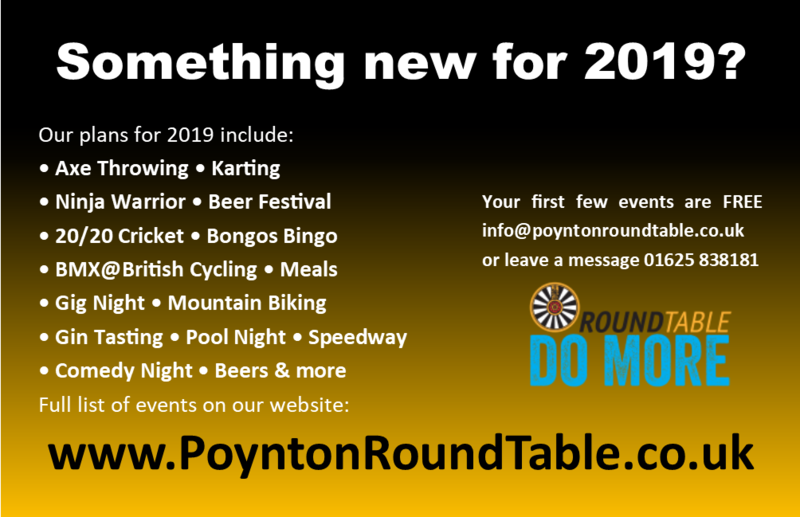 So if you (or someone you know, husband, partner, friend, etc) are male and age 18-45 years, then get them to look at what Poynton Round Table are doing in 2019. A full list of our planned events for 2019 can be found here. Contact us on info@poyntonroundtable.co.uk or 01625 831181 (and leave a message). We have loads planned, from active events like Karting to more relaxed nights of a meal and a few beers, and of course many events somewhere in-between these extremes. To see our upcoming social events check out our events page. For even more detailed information on what we have planned for 2018 and what we have previously done please visit the events section on here or our Facebook events listing: https://www.facebook.com/PoyntonRoundTable/events.